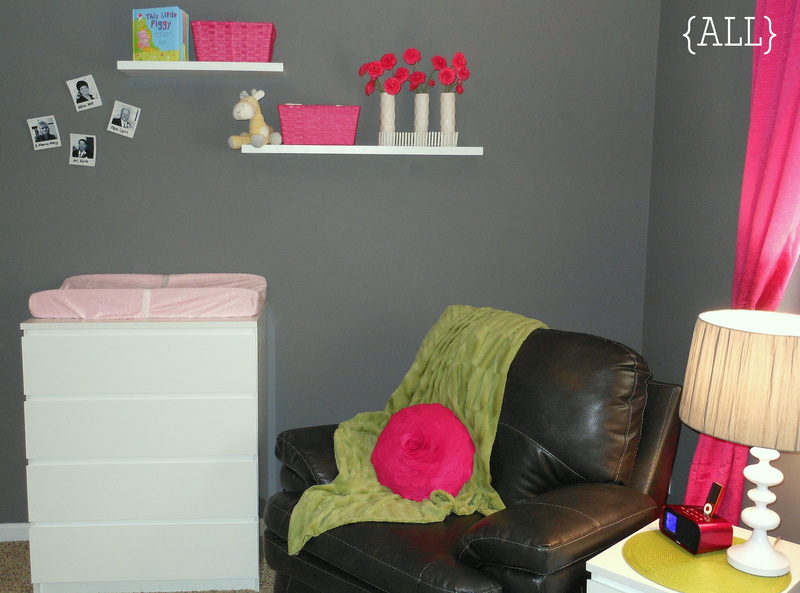 Pink + gray nursery: revealed! Only 10 weeks to go, and the nursery is reeking with cuteness! Aside from some small details, like finishing the homemade mobile and stocking up on diaper wipes, the nursery is done. In honor of Kelby’s family tradition, she’ll go by her middle name (hence the reason for the wooden A above the crib). Note the plastic snap-on polaroids in these photos–featuring headshots of the new grandparents, aunts and uncles. Here’s the wall of closets. Love all that storage space! Can’t wait to cuddle with Annistyn in this cozy chair! My grandma Anne (notice the “An” theme going on here? another family tradition) made this beautiful quilt wall hanging. I love the touch of old (quilting) mixed with the modern decor. Below the quilt is this sweet reading corner. Kelby already named the elephant Oswald, in case you’re curious. He’s goofy like that. These crisp white shelves might just be my favorite part! I’m amazed that my originally anti-pink husband loves it. I’ve already caught him admiring the room several times. Most importantly, I think Willow Annistyn will love it. Only 10 more weeks until she calls this girly (but not too girly) nursery home! Previous Post It’s all going to be okay. Next Post Feeding my freezer. I especially love the sheets, grandma’s wall hanging, the poloroids, and the pink flowers on the shelf- where’d you get them? Super-sorry to hear about the gestational diabetes but I’m glad it is going well so far. Tell Kelby that I think Oswald is the perfect name… very suiting. Thank you! We’re happy with how it turned out! Sheets were from Pottery Barn Kids, polaroids were Urban Outfitters and pink flowers were Jo-Ann Fabrics. Yeah, the GD is a bummer, but at least it’s nothing too serious when controlled. So far, so good! Ha – I’ll let him know! Love this!! Where are the shelves from? Thanks so much! We found the shelves at Lowe’s. Now that our girl is almost four months old, I love having them there to quickly grab a toy as we’re changing her. Thanks for reading and best of luck with the rest of your pregnancy. love your inspiration board you used for the nursery. it’s the inspiration for this baby if it’s a girl. i can’t find the sheets for bumper to save my life though. so if you happen to tire of the sheet i’d buy it off you! seriously!! Thank you! When are you due? Are you finding out the gender ahead of time? I’m due in march. Still super early in the pregnancy. This is our third baby and I’m leaning towards keeping it a surprise but I want to have a boy and girl nursery planned out and have the bedding and sell/return what I don’t need. I’m determined to find the wildflower bedding! I fell in love with it with the gray walls you choose! Congratulations! I love the wildflower bedding. If we have moved on to a toddler bed by then, I would consider selling. We have three of the fitted sheets. Take care!